Say good-bye to the days of storing large containers of wheat and cases of freeze-dried food that your family will never eat and to the rows and rows of unopened mystery cans on dusty basement shelves. 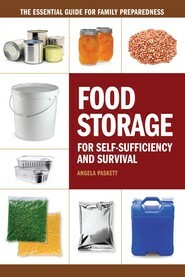 Say hello to a new way of looking at food storage. One that focuses on the food as much as the storage. Mother-daughter team Kathy Bray and Jan Barker have developed a fun, easy, and practical food storage program that makes it simple to develop and maintain a three-month supply of food items that can be used to make the meals your family already enjoys. By building a system based on the food your family already eats and the grocery shopping you already do, your personalized food-storage program can eliminate waste and unnecessary expense, requires no additional storage space, and guarantees that everyone in the family will be happy with the results. If you've wanted to start a food storage system for your family but didn't know where to start, grab your family's favorite recipes and let Kathy and Jan show you how easy it is to attain the peace of mind of being prepared. Kathy Bray is a retired businesswoman. she currently woks as a part-time church service missionary at the South Area Family History Training Center in Orem, Utah. She and her late husband, Raymond, lived for many years in northern California before moving to Utah in 1986. She is the mother of six children, grandmother of twenty-three, and great-grandmother of ten. Jan Barker grew up in northern California before moving to Utah to attend BYU. She and her husband, Jeff, live on seventy acres outside of Payson, Utah, and have six children and ten grandchildren. Jan is a businesswoman and an artist. She also has twenty-four years of volunteer service in the Boy Scouts of America where she learned to "Be Prepared." She owns American Beauty Academy in Payson with her husband and one of her daughters.